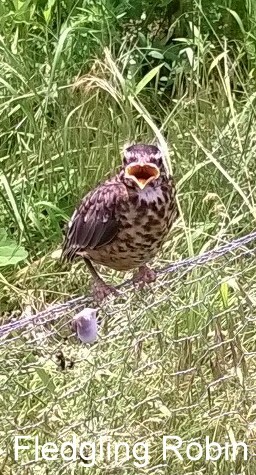 Fledgling Robin Patiently Waiting to Be Fed! 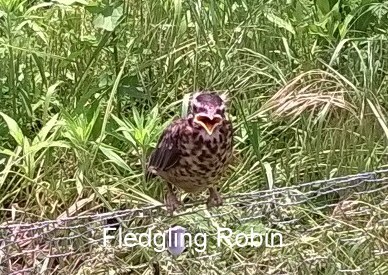 This cute little Robin fledgling is waiting for Mom and Dad to feed him big gobs of earthworms. The parents would not come to feed when I was nearby. This little guy kept Mom and Pop really busy!!! 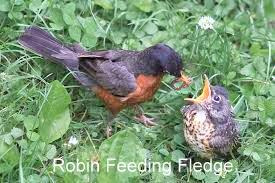 As I was watching they fed the fledge 4 times in 6 minutes! That was amazing! Such dedication! < Previous Got Milkweed? You’ll get Monarchs!! Next > For Milkweed Go Native!! Great post! We had Robins falling out of their next here, too. We have cats, though so the parents were going nuts. I watched one f the cats follow a baby across the yard, but it never touched the baby at all. The other cats weren’t even paying any attention.